Greetings from the 2012 ASM Beneficial Microbes Conference held in beautiful San Antonio (Ill ignore the torrential downpours from Friday for the moment). 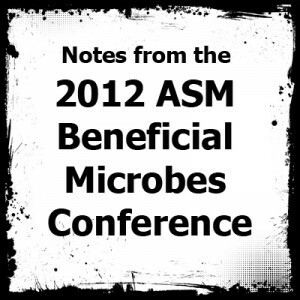 Despite the more restricted theme, at least compared to the ASM general meeting, the organizers did a great job of inviting a broad variety of speakers. Of course, we heard about insect endosymbionts, the mouse microbiota, and Vibro-squid interactions, but there were also great talks about fungal epiphytes in plants (Rusty Rodriguez), the bacteria on the surface of leaves (Steven Lindow), and colony development in Choanoflagellates (Nicole King). The two most enlightening talks came on the final day and together they present an interesting perspective on microbial research in the age of easily generated sequence data. Angela Douglas of Cornell University presented research from her lab on the transfer of metabolites between the endosymbiont Buchnera and its aphid host. Annotation of genomic data from the host and symbiont suggests that the metabolism of the two organisms is intertwined and production of essential amino acids, which the host cannot obtain from its nutrient poor diet, requires the shuttle of intermediates at a particular step in the pathway. Curiously, the measure of metabolic inputs and outputs did not find evidence for the transfer of this intermediate between the two organisms, but instead finds that an intermediate one step upstream in the metabolic pathway is transferred. The take-home message is that, while genomic (or transcriptomic, metabolomic, etc.) data provides a framework upon which hypothesis are built, empirical evidence and experimentation are essential to support these hypotheses. The final talk was by Jon Sanders, a graduate student at Harvard with Naomi Pierce and Peter Girguis. He spoke about neotropical herbivorous ants and readily admitted that not much is known about the ecology of most of the species he studied. Using bacterial 16S data, he presented a new way to look at OTU cluster analysis. By varying how strictly OTUs were defined (for example 95%, 97% or 99% similarity), one could gain insight into whether the microbiota is evolving under neutral or selective conditions. This is important because, as stated above, very little is known about these ants in their natural habitat. However, these methods provide a hypothesis for which ant taxa are coevolving with their microbiota (clades that show evidence for natural selection) and now future experiments can focus on these ant taxa to look for support of this hypothesis. The broad message from these two talks is clear. No matter what microbial community one is studying (yes, even those inside the built environment!) 16S characterization, metagenomic profiling and other descriptive techniques are only the beginning. We as a research community need to continually think of creative and innovative ways to test the hypotheses that the “omics” data are presenting to us.